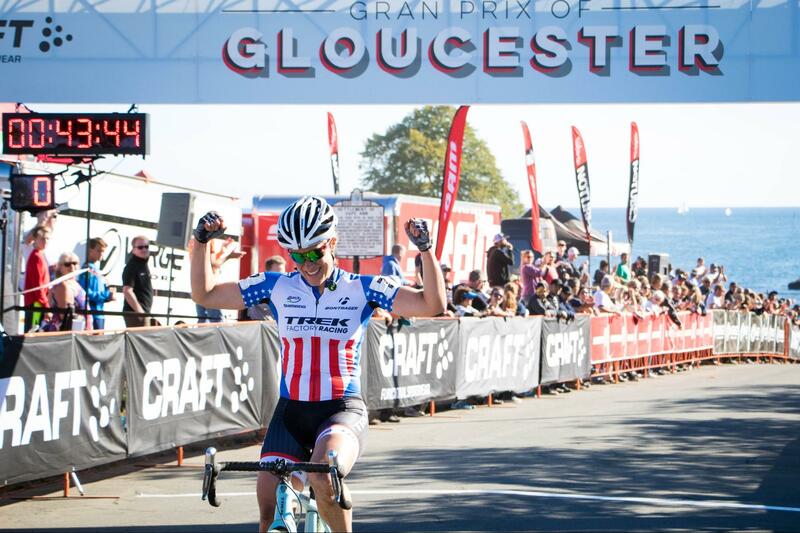 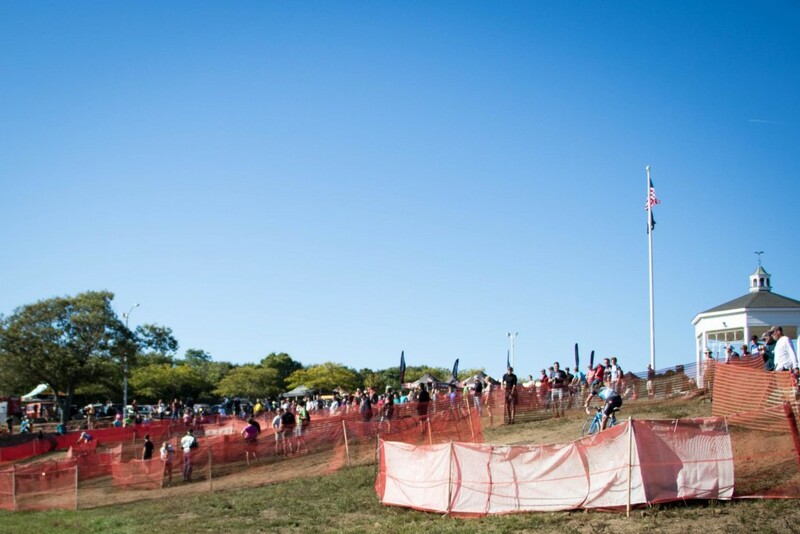 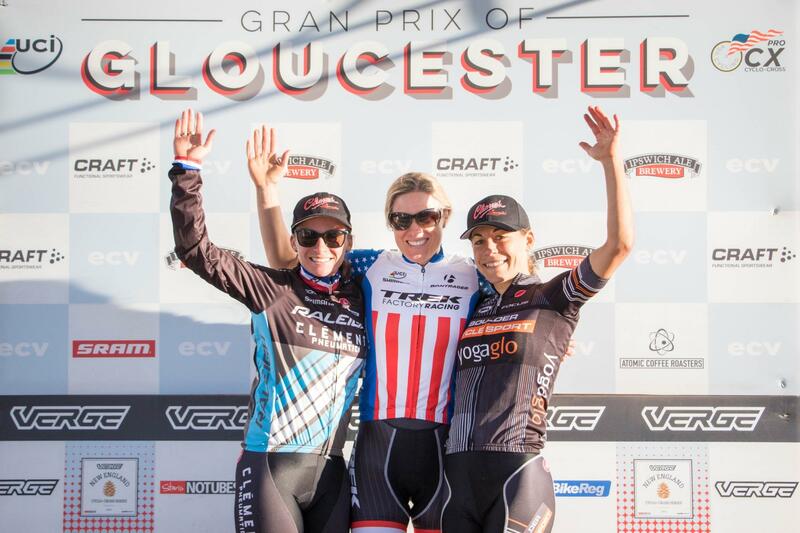 Warm weather, sunny skies, and clouds of dust persisted at day 2 of the Grand Prix of Gloucester, but that did not stop Katie Compton (Trek Factory Racing) from taking a decisive win after yesterday’s 3rd place finish. Caroline Mani (Raleigh-Clement) took a step down the podium today, but still had a great ride for 2nd, and regional favorite (and Gloucester native) Crystal Anthony (Boulder Cycle Sport/YogaGlo) took 3rd on the day. 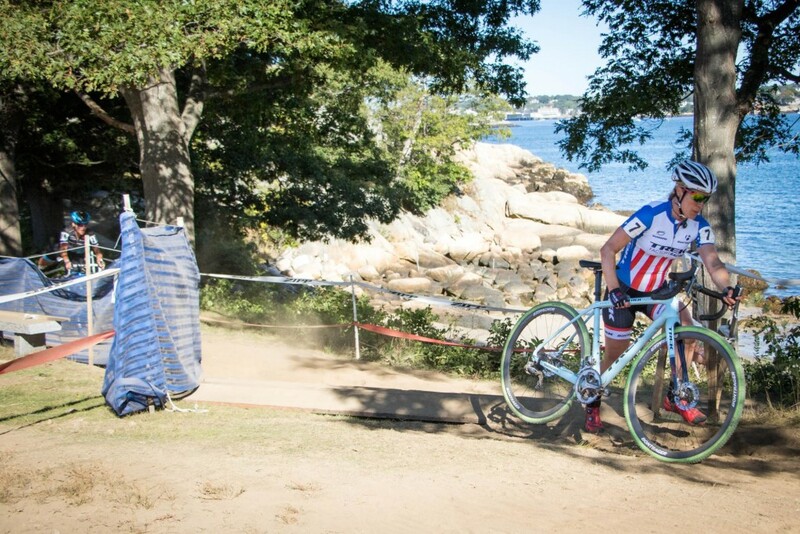 From the first lap, Courtney McFadden (American Classic) led through the course’s tricky chicane section and created a small gap. 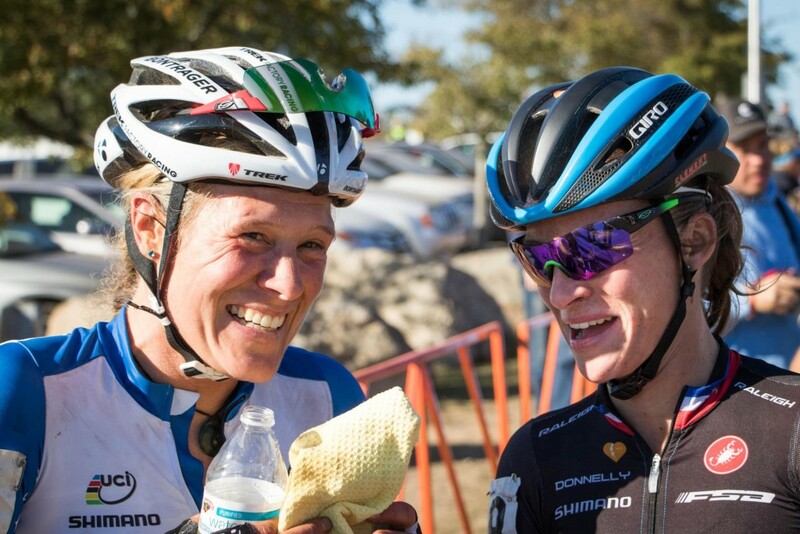 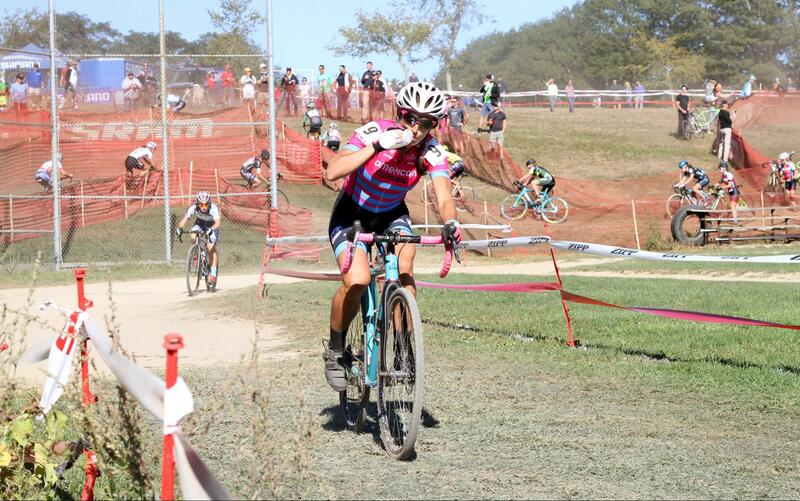 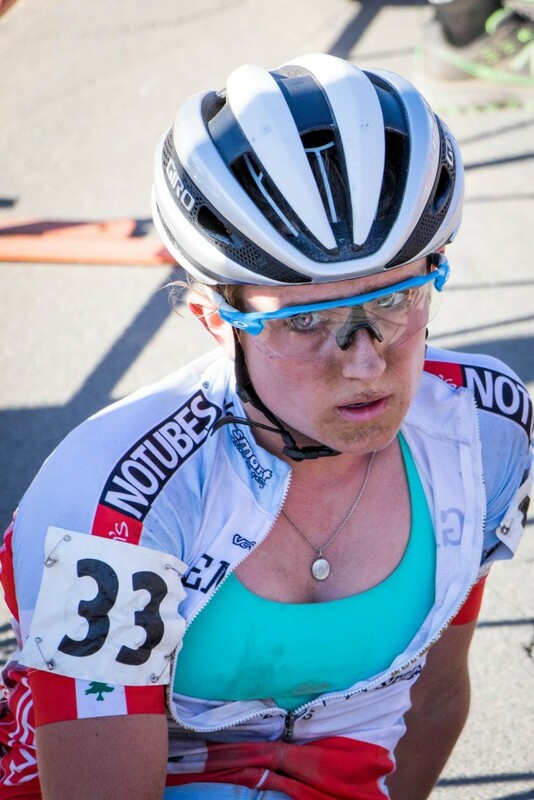 Perhaps sensing it was a little early to redline it, she sipped a bottle and was soon joined by Arley Kemmerer (Level Eleven Racing p/b PB2). 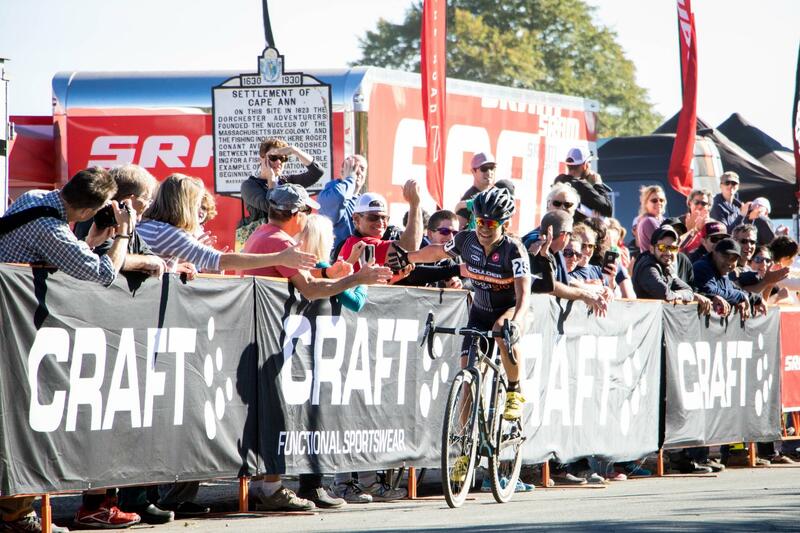 Jena Greaser (JAM Fund kit, but no team listed in results) powered her way to the front on the second half of the first lap and set a furious pace, with McFadden, Caroline Mani, and Helen Wyman (Kona Factory Racing), following. 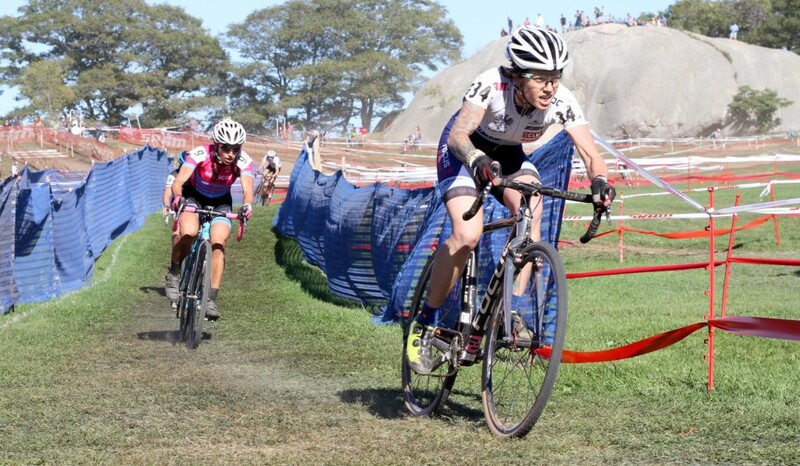 Katie Compton was never far behind and joined the lead group before the end of the 2nd lap. 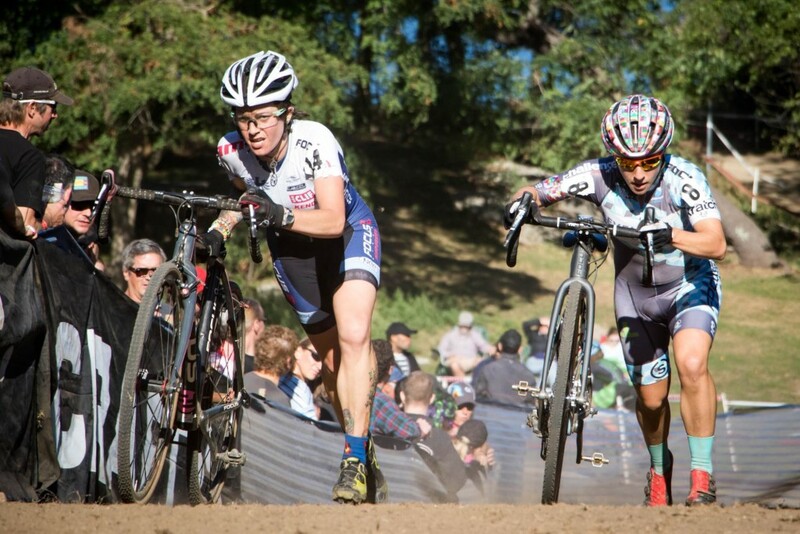 After 2 laps, Greaser had started to fade (9th place overall), and McFadden fell just off the pace, leaving a familiar scene at the front. Reaching the planks at lap 2, Wyman, Mani, and Compton led, followed a few seconds back by Crystal Anthony and McFadden. 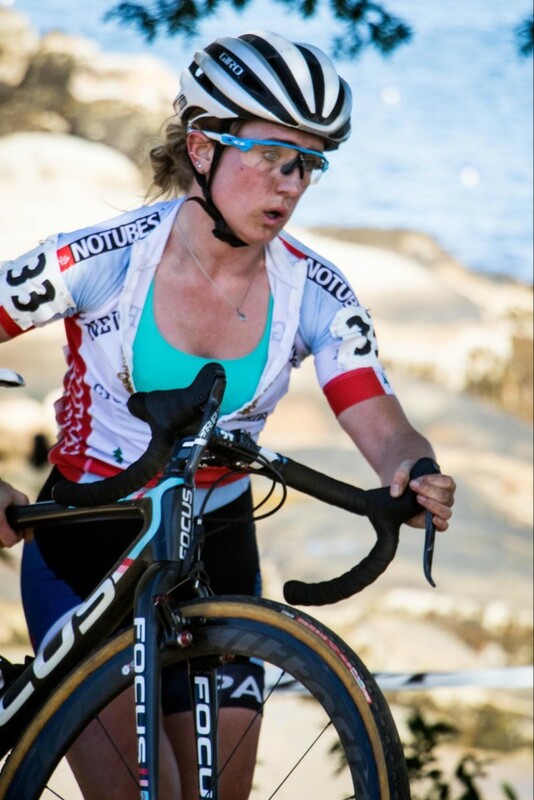 Absent from today’s fireworks was Ellen Noble (JAM Fund) who didn’t quite get the same explosive start as yesterday, having to fight her way back from several places down. 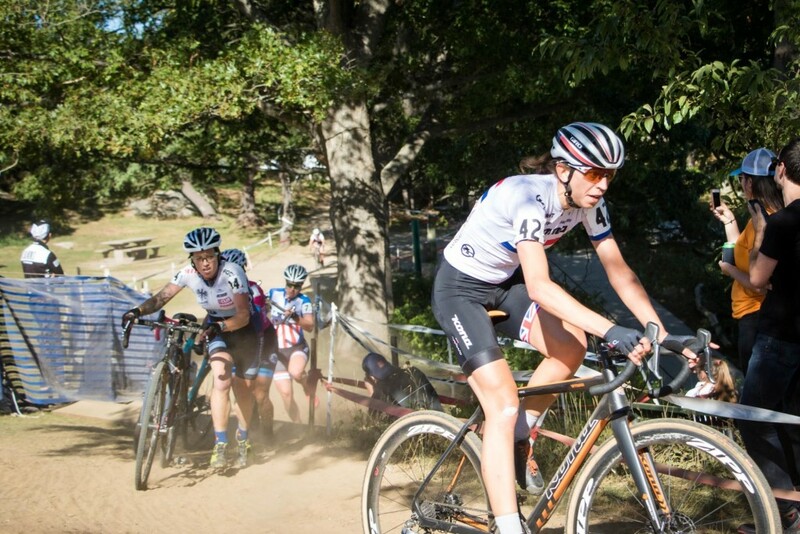 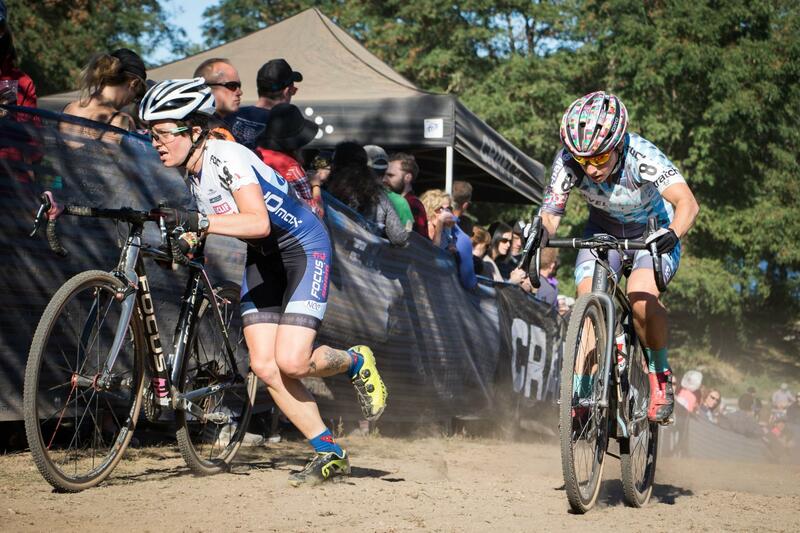 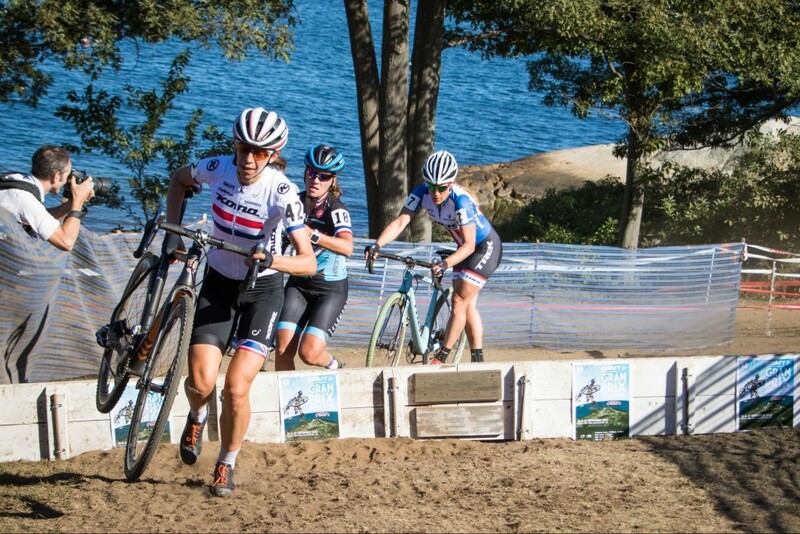 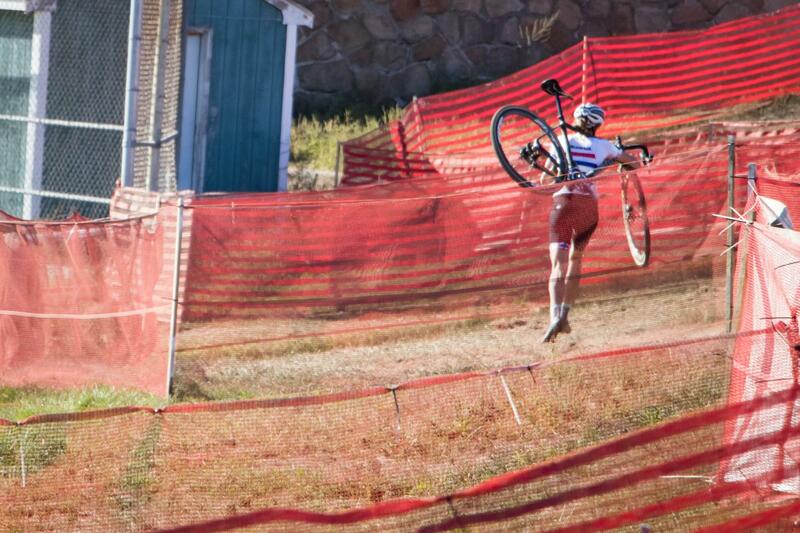 Although she looked a bit less composed and in-control compared to her prior day’s attacks and far deeper in the pain-cave, she was able to fight back for a 6th place finish. By mid-lap 2, Compton had made the decisive move of the race: after the trio disappeared on the far side of the course, Compton reappeared having opened a gap against a Mani and a trailing Wyman. 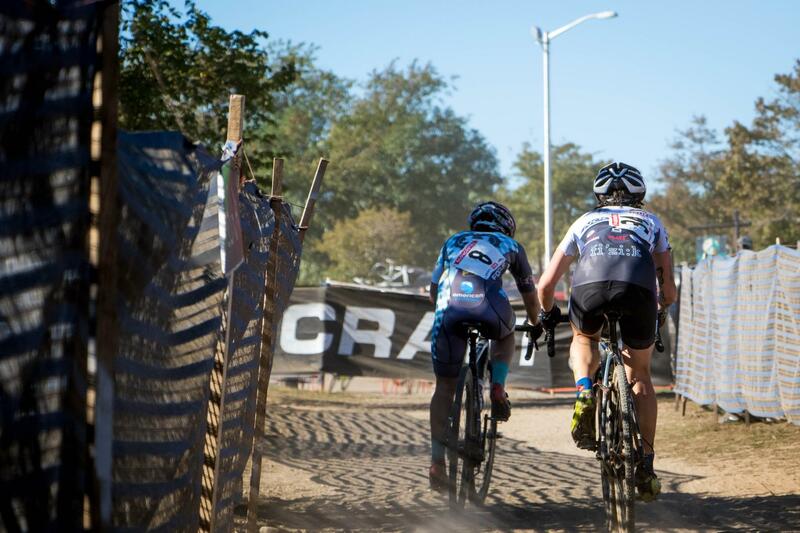 The gaps between leaders would only extend over the remaining race, and top-5 looked set: Compton, Mani, Wyman, Anthony, and McFadden, with considerable time between all. 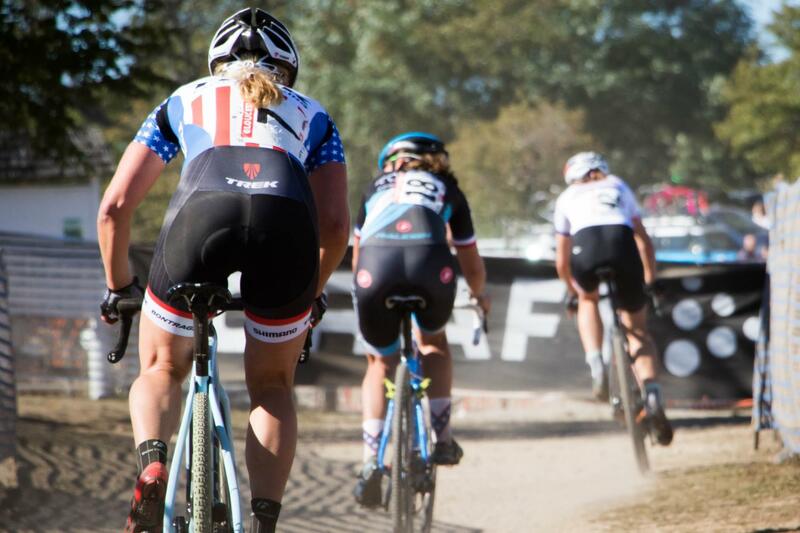 With 2 laps to go, Wyman suffered an ill-timed flat, forcing her to run through the long, off-camber SRAM chicane section. 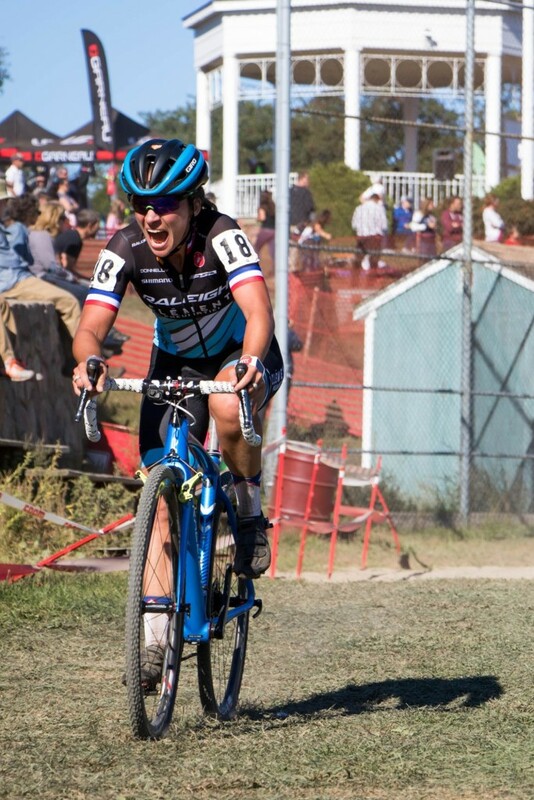 By the time she re-mounted on the next flat section to limp to the pits, Anthony had opened up space against Wyman to clinch the remaining podium spot.